When his father vanished after uncovering the secrets of the ancient Book of Fennore, Rory McGrath transformed from an innocent boy into a troubled, cynical man. Leaving Ireland, he shunned his family, his heritage—and the very magic that defined his people for centuries. Then he began dreaming of an ethereal beauty, who calls him to return home to a destiny that will take him beyond the realm of anything he imagined. Lured to the castle ruins where his father disappeared, Rory is plunged back in time, and into the body of another man—a man betrothed to the very woman of Rory’s dreams. In possession of the secrets of his past, his family, and his identity, her hold on Rory is inescapable. For she is his doom, his salvation—and his destiny. Originally published May 2010 in trade paperback and eBook and March 2012 in mass market paperback by Berkley Sensation. 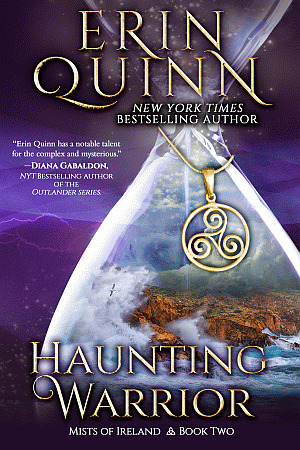 Review Score: A+ “I am just in total awe of Ms. Quinn’s Haunting books. These first two books are some of the best I’ve read in the last year.” The Good, the Bad and the Unread, Sandy M.